"It's been so uplifting for me to see hundreds of kids playing at the Helen Diller Civic Center Playgrounds every day," said owner Sam Mogannam of the all-outdoor cafe's location on public land, right beside the newly remodeled playground and across from City Hall. 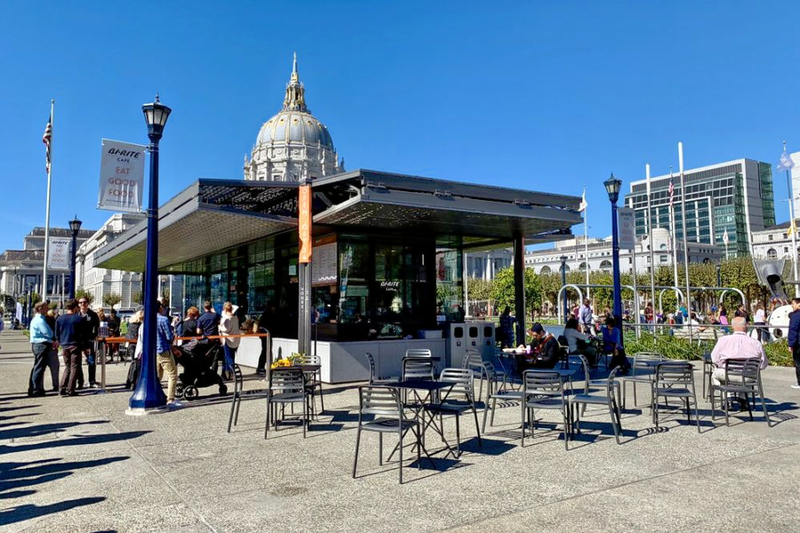 Although it serves coffee drinks from local roasters Sightglass and Samovar tea, the al fresco cafe also offers kid-targeted organic milk and apple juice, as well as simple menu items such as a cheddar quesadilla. And through Friday morning, the cafe is offering a promotion to the first 40 customers of the day: with any purchase of $10 or more, they'll get a free 12-ounce Bi-Rite Cafe Klean Kanteen insulated tumbler. With a four-star rating out of five reviews on Yelp so far, Bi-Rite Cafseems to be a welcome addition to the neighborhood in its early days. Head on over to check it out: Bi-Rite Cafe at Civic Center Plaza is open from 7 a.m.-5 p.m. on weekdays and 10 a.m.-4 p.m. on weekends.